Kubera Pendant - ESSI114 - In Tibetan Buddhism, Kubera represents wealth. EcoSmart Designs makes story-carded, recycled, American Made, leadfree pewter pendants. Each pendant comes with a display card that has the meaning of each Spiritual Image or Diety. 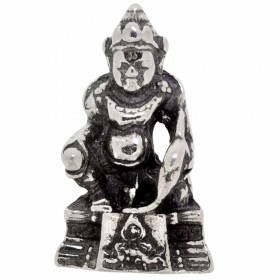 EcoSmart has one of the largest collections of Spiritual Pendants in the United States and certainly the only one with such an extensive explanation of each. Customers truly value the fact that these images come on explanation cards. Particularly in the spiritual arena, people want to know the meaning of the diety or image - whether for personal or as a gift. MINIMUM order is 3 pcs per style, minimum for Eco Smart is $100.